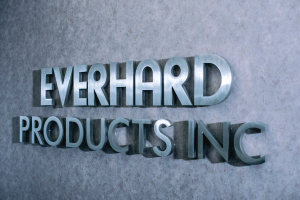 As a successful precision metal fabricator, Everhard Products stays close to its customers, designing the most effective manufacturing processes; meeting quantity, tolerance and material specifications; and providing a full range of services from design to delivery. We act as extensions of our customers’ engineering and manufacturing operations. We go beyond basic metal fabrication to provide flexible capacity, order management, collaborative design/engineering expertise, and exacting quality standards and documentation. We recognize that this advantage in strengthening customer service brings about a working relationship that truly is seamless. To accomplish this, we work with our internal departments and suppliers, using our ERP system’s integrated processes, all of which complement the manual workflows from the starting design to post-sales customer service. Although we are proud of our Quality Policy, we know that quality to our customers takes more than just a certificate. It takes a team effort of well qualified associates with the best resources, empowerment, environment and motivation to make the system work. We believe that our true quality statement is best expressed by the feedback from our customers and suppliers. We encourage prospective customers to speak to our current customers as customer satisfaction is the goal we seek to achieve.